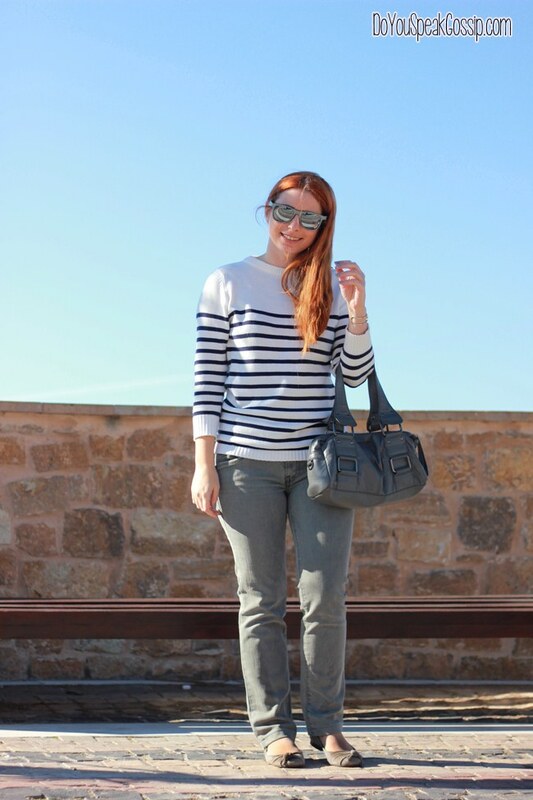 Casual gray and stripes | Outfits - Do You Speak Gossip?Do You Speak Gossip? Can I say one more time that I’m terrible at giving titles to my posts? Oh, yes I am! 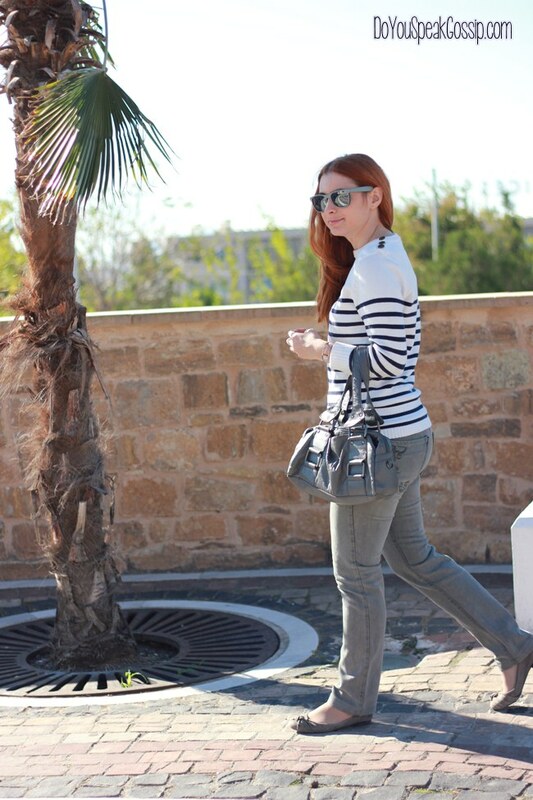 Anyway…I wore this outfit last week to meet with Olie from the blog Fashion Addict. She’s the one who took these pictures, and I want to thank her for being so patient with me. 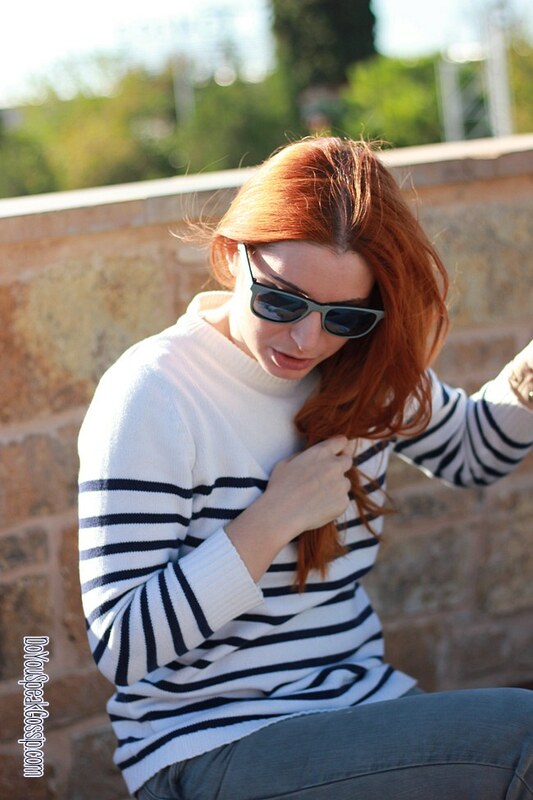 You see, the wind was particularly annoying that day, so my hair was all over the place. In some pics I looked like I was being abducted by aliens or something…Something else I’m not good at: posing. Even after so much time, I don’t feel comfortable in front of a camera, and I probably never will. But this is what I wore, and I wanted to show you despite everything. Do you like it? P.S. 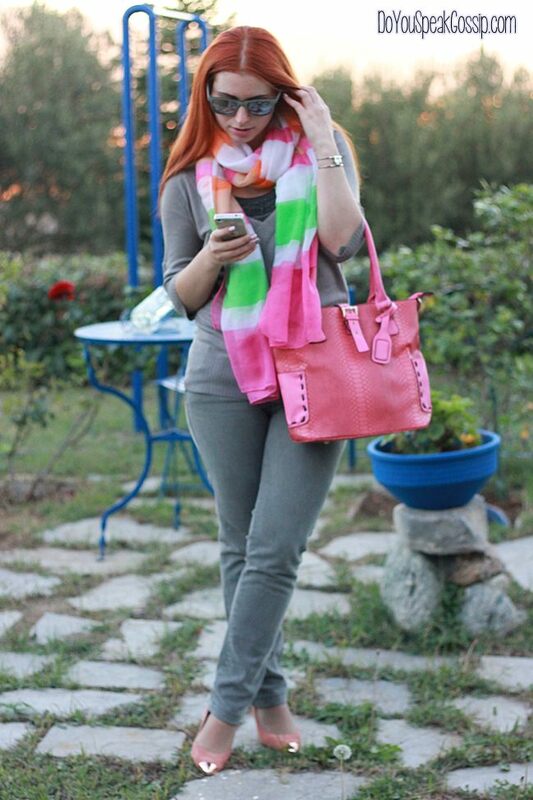 This was the last outing of my gray bag. RIP perfect-gray bag that came with me from Paris some years ago. I could have sworn you were leather. Damn! Υ.Γ. Αυτή ήταν η τελευταία έξοδος της γκρι τσάντας μου. Αντίο αγαπημένη γκρι τσάντα που ήρθες μαζί μου απ’το Παρίσι πριν μερικά χρόνια. Θα ορκιζόμουν ότι ήσουν δερμάτινη! Να πάρει! Olie recently posted.." Meunique GIVEAWAY "
S’euxaristw para poli! Na’sai kala! Na to epanalavoume opote thes…. katarxas mou einai toso periergo na se vlepw me panteloni! !se sunithisa me forematakia k foustes..k deuteron,ti epathe i tsanta ? great loko! like it a lot! like the way you styled the pieces! Γενικα τρελαινομαι για μαρινέρες, ειναι τοσο κομψή και μαζι ευκολοφόρετη μπλούζα. Thank you very much sweetie! I’ll check it out as soon as possible, but please don’t leave extra links in the text of your comment (you can leave your blog’s link in the website/blog URL box, and you can also check the box underneath it, that says comment luv, to get one more link to your latest post). All extra links are being deleted per my blog’s policy, and they usually make the post end up in my spam folder and I have to fish them out. Just a heads up! oh what happened to your bag? and i remember you were taking photos of your bags for your shop, how did that go? 🙂 i really like the jumper you’re wearing here and the sunnies too, what a nice casual outfit M!